Happy Learning: A Guide to Honeysuckle Cottage - Welcome to the English Garden! Happy Learning is a journey that lasts for a lifetime. It is a journey of discovery, exploration and delight in learning. We begin this journey at birth and we are given all the tools we need to become successful learners. We do, however, need some guides along our stages of growth. 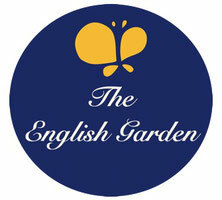 The English Garden is a safe, friendly and imaginative place, where young learners can grow. In The English Garden, we begin with Honeysuckle Cottage, where our first character Ruff will be your child’s friend and guide. Ruff will teach your child many things in a child-friendly, ”HAPPY” way by using music as the primary tool. The result is delightful learning for both children and those who teach them. Learning simple subtraction becomes a musical game of pulling the goats home from Billy Goat Hill with Ruff. Learning about animals becomes a plea for Just One More Pet from Ruff to his mom. By playing make-believe in The Weather Bee, your child can learn how to predict and ask questions. Learning colors and beginning phonics is disguised as a magic show to enchant the imagination. Science lessons become an adventure to hunt for bugs with Ruff. Beneath the fun and games, there are many layers of learning and Honeysuckle Cottage is designed to help your child become a HAPPY LEARNER, who has learned how to learn. It is my hope that this blog, which will be full of activities and ideas to enhance your English Garden experience, will give you hours of fun and spark ideas of your own on how to make Ruff and Honeysuckle Cottage come alive! If you come across any questions, ideas or comments while exploring Honeysuckle Cottage, please comment below. I would love to hear from you! You should take part in a contest for one of the greatest sites on the internet. I most certainly will highly recommend this blog! Do you have a spam problem on this website; I also am a blogger, and I was wanting to know your situation; we have created some nice procedures and we are looking to swap techniques with others, be sure to shoot me an e-mail if interested.